If you’ve seen my previous fall home tours this season, you know that farm animals are a central theme in my humble farmhouse. The kitchen is no different! I found the Farm Fresh Daily sign at Antique Farmhouse. 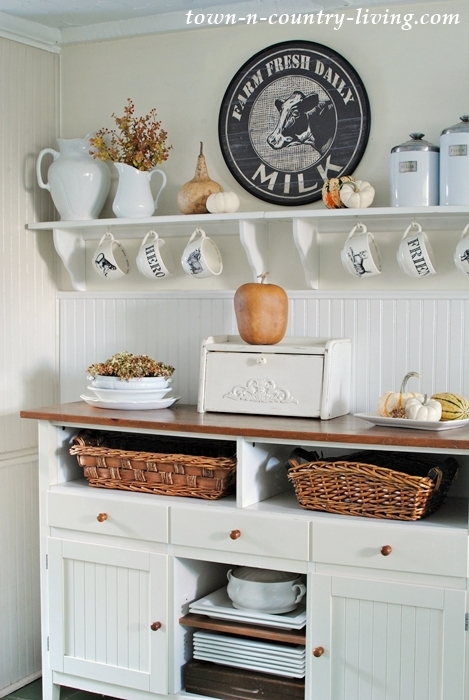 The size is perfect for the space above the kitchen sideboard’s shelf. 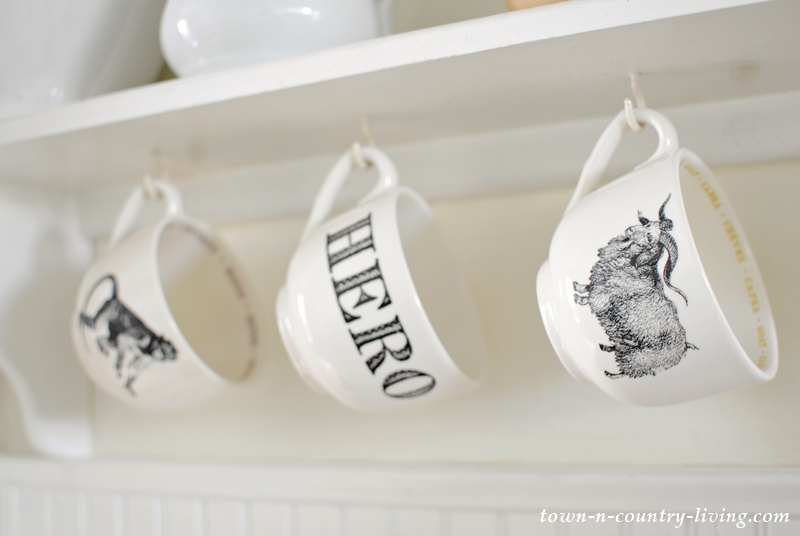 The adorable farmhouse mugs are from a local eatery in my favorite shopping district in Geneva, Illinois. Every time I visited the deli to order a sandwich or salad, my eye was always drawn to the over-sized mugs. I finally broke down and bought them. They’ll be perfect for serving homemade soup, chili, and hot chocolate! 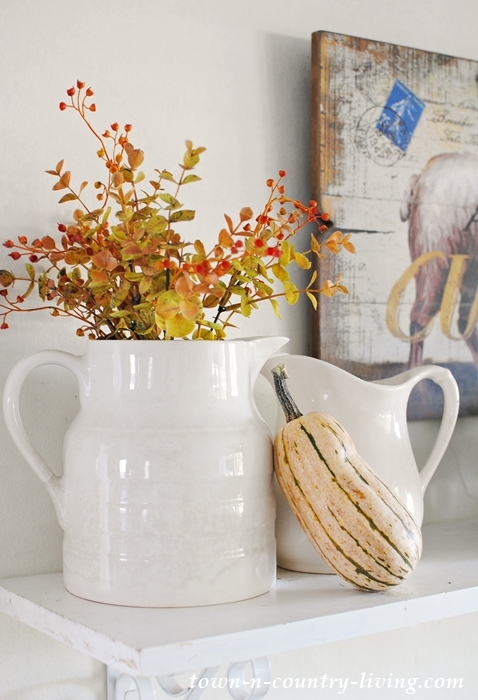 A white ironstone pitcher gets a bouquet of faux fall foliage to add just a touch of color, along with dried gourds. 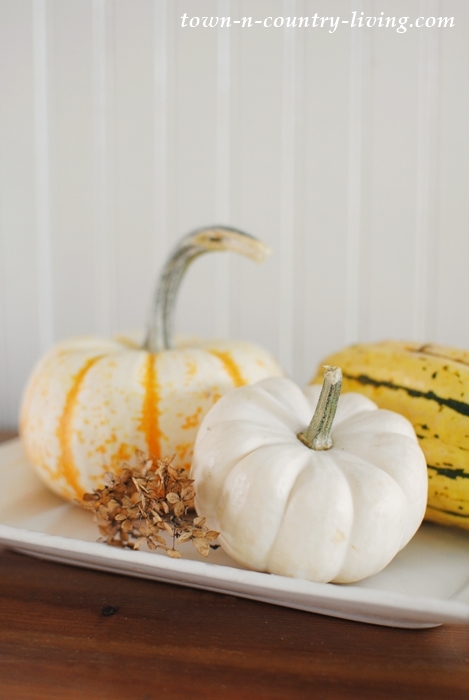 Simple fall decorating is often the prettiest. My kitchen sideboard is from IKEA, unfortunately they no longer offer it. I actually purchased it from a friend several years ago. 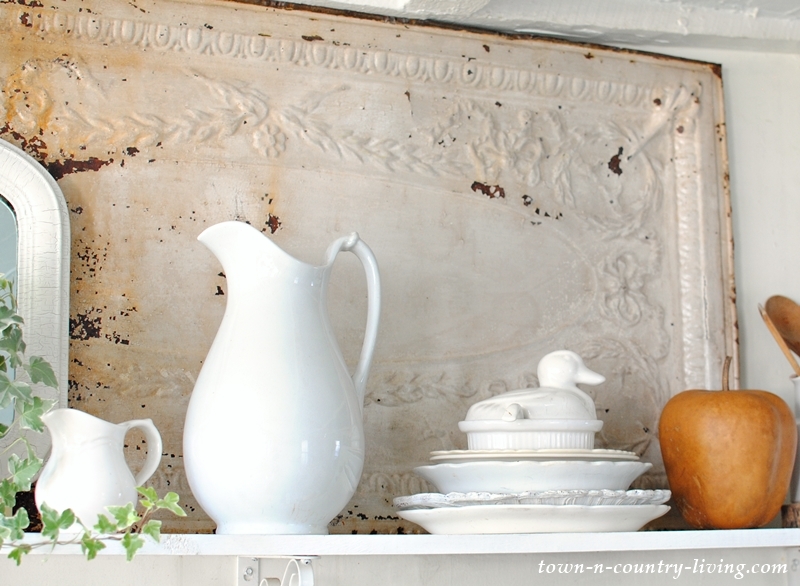 Similar fall decorating pieces fill the other side of my farmhouse kitchen. My favorite farm animal dish towel hangs over the sink (one day I’ll have a farmhouse sink!). I moved our ceiling tin and rested it here on the shelf above the stove to add a bit of texture. The ceiling tin used to hang above the sectional in my family room. You can see the new piece of art in that room if you visit the second part of my fall home tour. My DIY knife holder is still holding up and no, the knives don’t cut the books or tear them up (so no books were hurt in the making of this project). 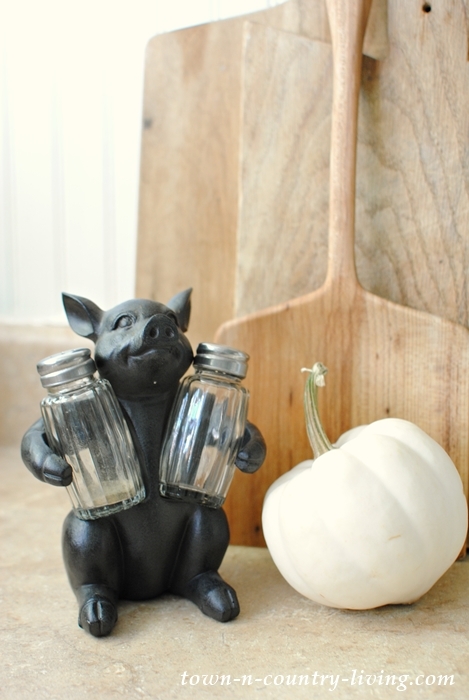 I found this little piggy salt and pepper caddy at Kirkland’s. I’ve yet to fill it with salt and pepper. Sigh. I’m starting to build a respectable collection of hand-carved wooden spoons. The majority of them are from Polder’s Old World Market. They’re a little pricey, but so worth it! 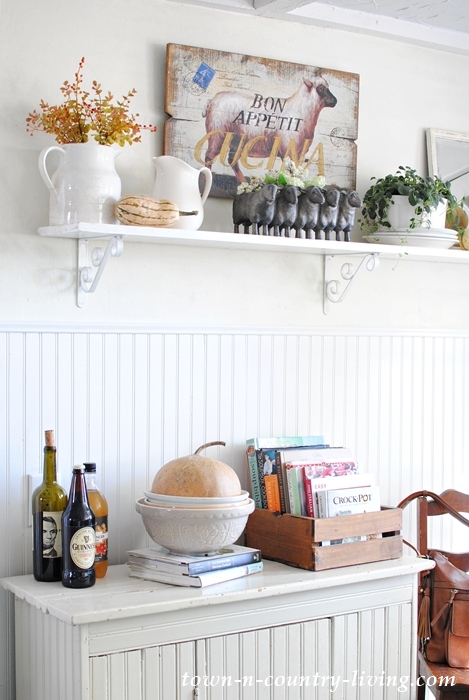 Favorite cook books are cradled in an old wood crate – always within easy reach! 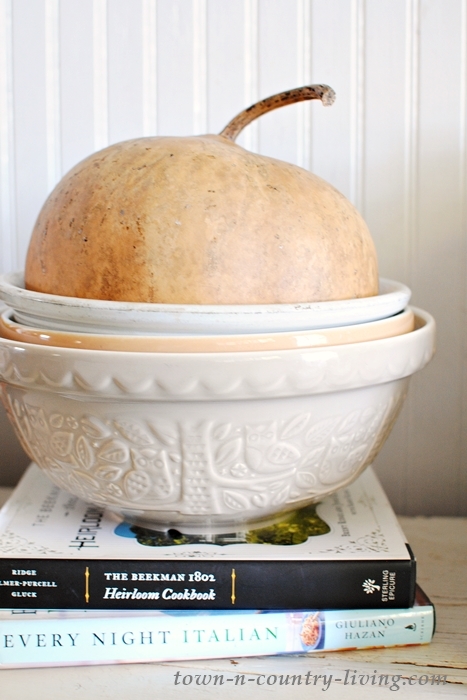 New Mason Cash bowls hold another dried gourd. Note the woodland theme in the scene on the outside of the bowl. I pulled out my French lamb sign to go with my little sheep planter. I thought they were the perfect pairing for my fall decorating theme in the kitchen. A few more fall floral sprigs fill another vintage ironstone pitcher, while a tiger squash rests haphazardly along side. I’m really into dried gourds this year. 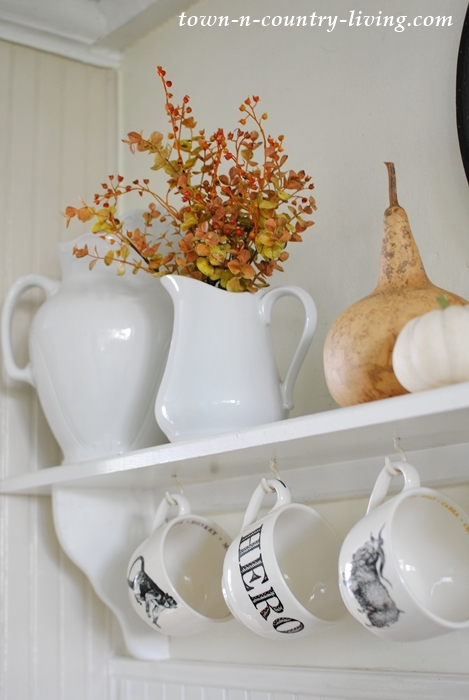 You can see how I used them in the dining room in my first fall home tour this year. 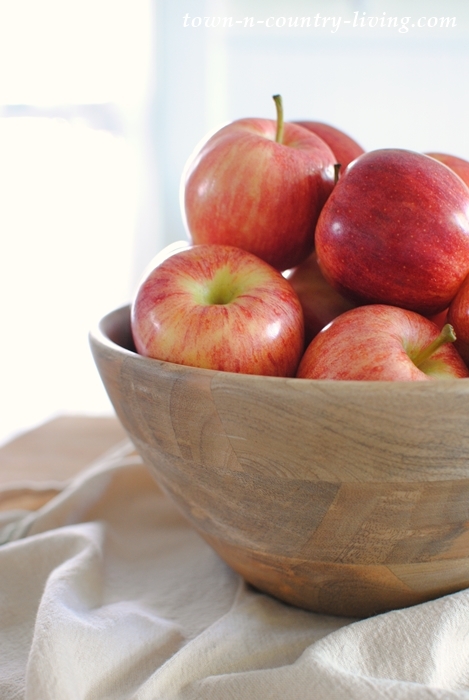 I had planned to use this wooden bowl of apples to make a pie or something, but the bowl is about half empty now. They’re perfect for fall snacking! Next up on today’s tour is Pam from House of Hawthornes. I love her vintage style! The rest of the bloggers are listed below. I always love seeing your kitchen! The milk sign is awesome and I’m the loving the new oversized cups. 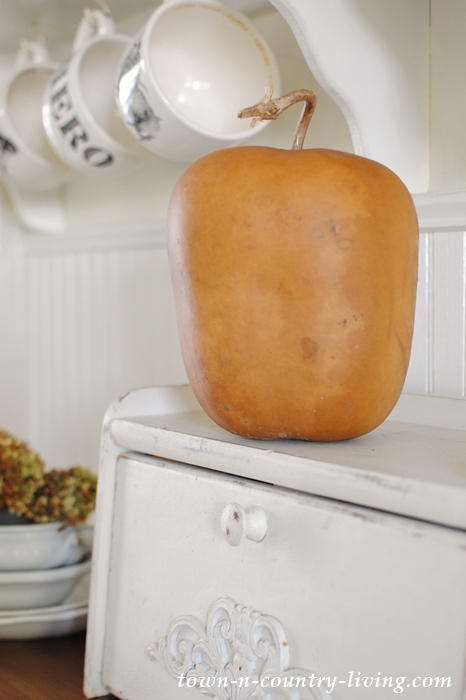 Your kitchen looks beautiful…all ready for fall! Love those sheep, they are just darling. I love it…. 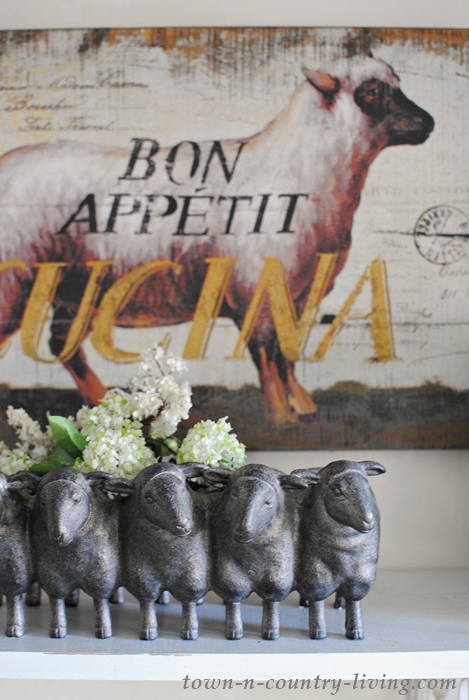 the sheep planter is amazing!!! the whole kitchen is so “Fall” comfy cozy!!!! thank you for sharing !!! Your home is gorgeous! I hope our farmhouse (that we purchased 2 years ago) will look just as good someday! Farmhouse perfection! 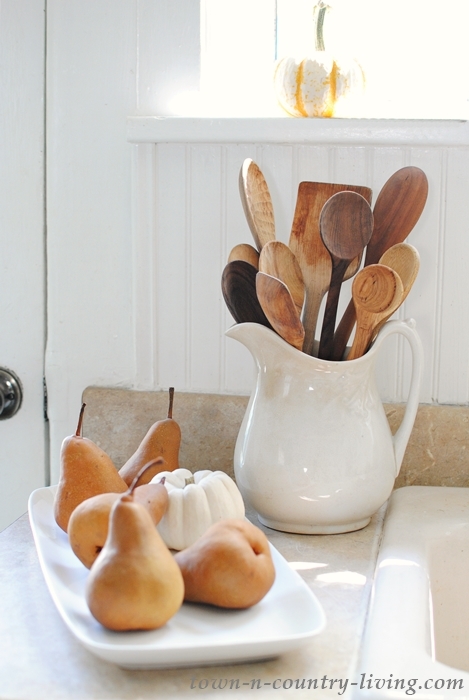 This might be a weird thing to comment on, but I love your wooden spoons! Hi Stacy! I don’t think the spoons are a weird thing to comment on. I love them too! Well….first time visitor here. 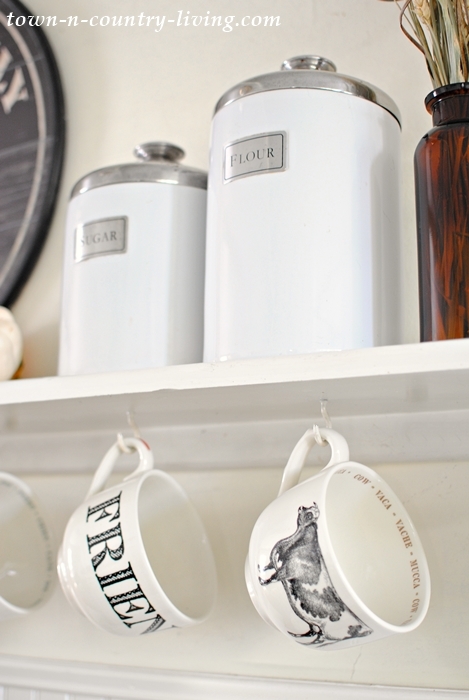 I really do like your kitchen decor…just ordered that sheep planter and the dish towel too…now if only could find that awesome french sheep sign! 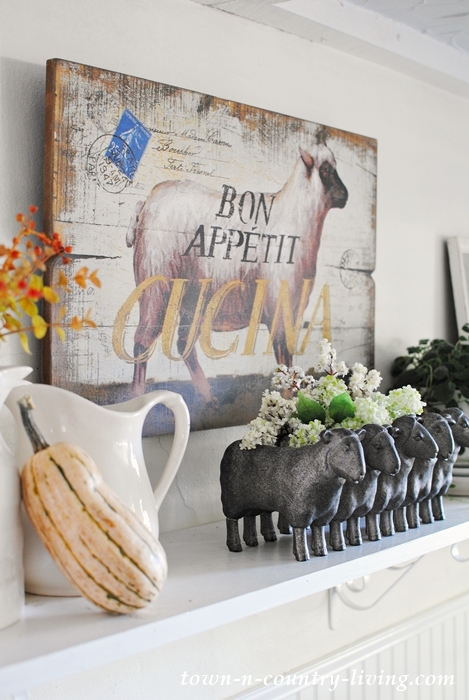 I love sheep as well as rabbit decor. Those cups are nice. I have too many, but could make room 🙂 Are you in Illinois? My home state. Coloradans now. Thanks! will definitely be back. I am in love with your green floor tile!! It is so unique. I love your farm animals and pretty shelves. That book knife block is so creative too. Loved doing this with you! So perfectly farmhouse. 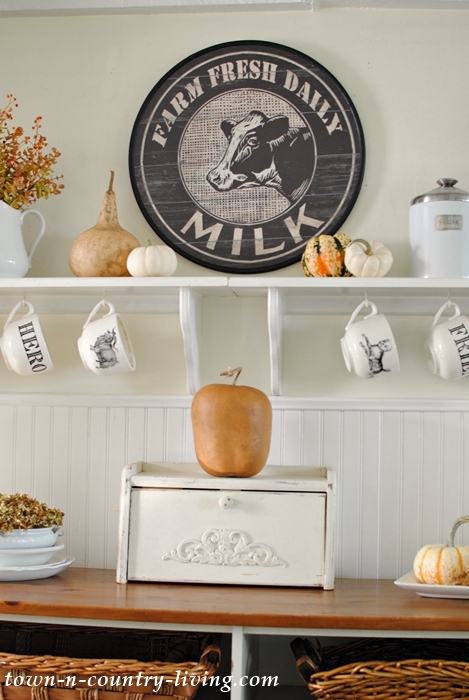 Love everything about it from the milk sign to your knife holder (so cool!). Thanks so much for taking part in our fall tour, Jennifer. 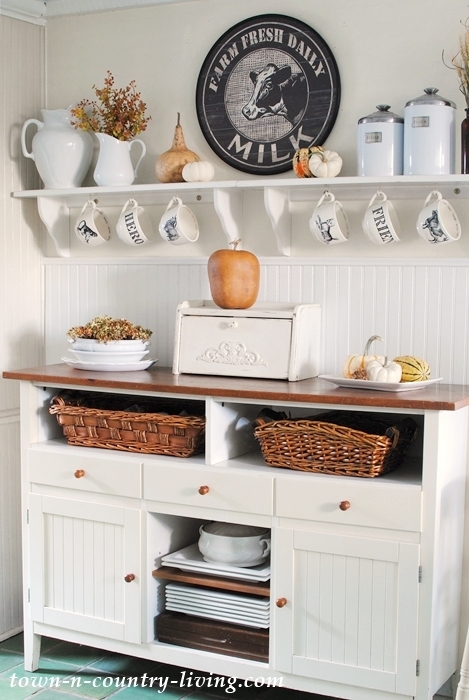 How great is your farmhouse fall kitchen and all the animal motif. I drink my hot tea each morning from an oversized mug so for me, the bigger the better. love it all. ps. 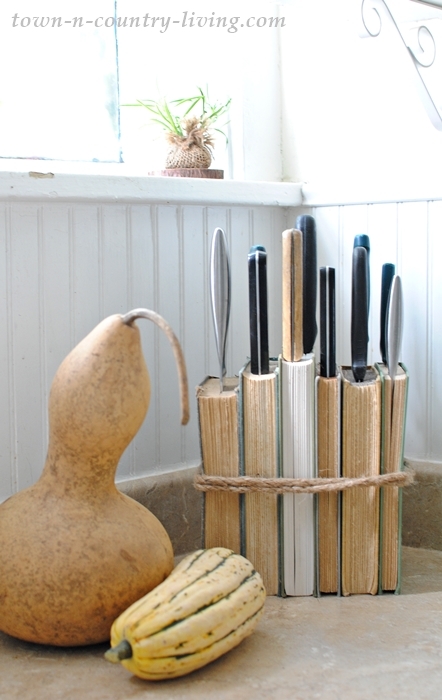 that knife holder is so creative i hope you enjoy the beautiful fall season. 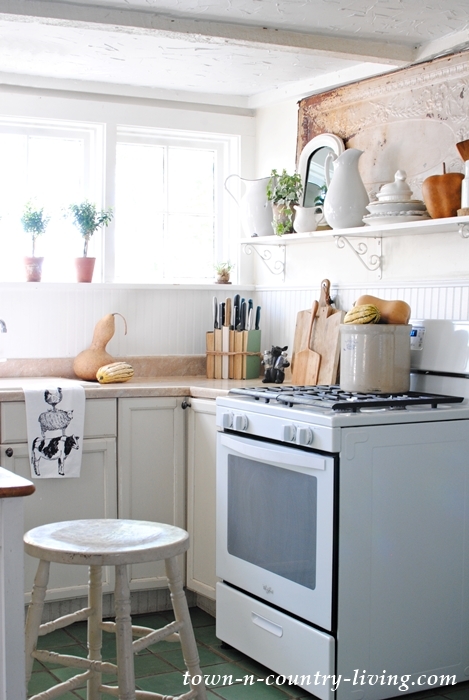 Your farmhouse kitchen is adorable! And those sheep are SO cute! Love all the farm animal decor you’ve added throughout. 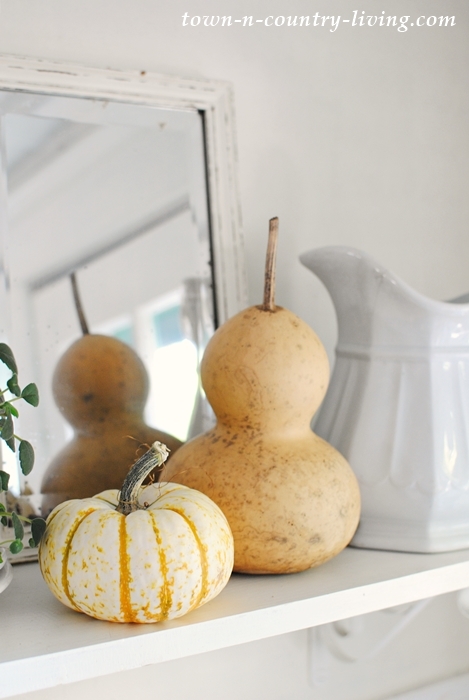 Your kitchen is always stunning and I love seeing it decorated for fall! I have been searching and searching for cups similar to these!! Does the local eatery have some more?!? !